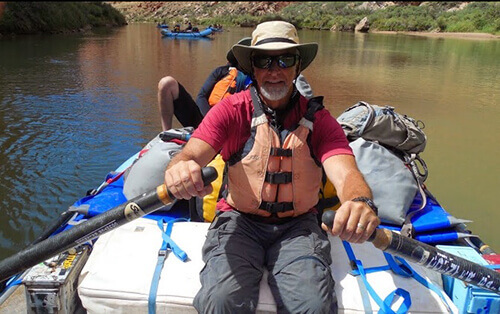 Mark went on a 13-day oar trip with us back in 2014, and the canyon and the river still have a piece of his heart. He wrote this guest blog for us in August; we hope you enjoy reading about the canyon from the perspective of one of our guests! The term “bucket-list” has become popular as of late, and represents those things people want to do or accomplish before they die. I don’t have such a list, but I can see how things like driving a race car, running with the bulls, or hang-gliding, could be items people might like to put on their list. I’m not knocking people for having such lists, to each his/her own, but somehow I can’t see such a place as the Grand Canyon being on a bucket-list. As I understand them, bucket-list items are things people want to do and then cross off their list, in a kind of “been there, done that” fashion, as they flaunt their accomplishment to their friends on Facebook, and then wipe their hands of it. No, for me, the Grand Canyon is far too majestic a place to simply see once, and then after putting it in a box so to speak, placing it on a dark and dusty shelf of conquests only to be forgotten. Seems almost sacrilegious, sad, heartbreaking really. There are numerous places on this earth that deserve the description grand, or great, or majestic, and we have described, and/or named many of them as such. Other places, even without the “grand” moniker, we still know and think of this way. Now, admittedly, I haven’t been “everywhere,” but I have been to my share of incredible places, and in my humble opinion, the Grand Canyon out ranks them all. In all fairness, I can understand some would wonder why I feel this way, after all, we all have our own unique sensibilities. But for me, as much as my sensibilities are impacted powerfully by numerous other places, none can compare with the way the Grand Canyon impacts mine. Maynard J. Keenan wrote and sings a song with his rock group Puscifer, entitled “Grand Canyon.” In this song he uses words like “majestic,” “mystery,” “awaken,” “the edge of forever.” I think the words mystery, and standing on the edge of forever could be the keys to the difference that separates the Grand Canyon from all other places. As fantastic as other places are, they don’t possess the mystery the Grand Canyon does. As beautiful as the other places may be, they don’t have the secrets the Grand Canyon holds out to us just by standing upon its rim, as if on the very edge of forever. My experience with the Grand Canyon is undoubtedly not as extensive as many, many others, but I have not just visited once, and as awe inspiring as it is, I did not stop at the rim. My first glimpse of the Grand Canyon occurred when I was just a kid, a boy of about 9 years old, and I was living in Roseville, Michigan, a suburb of Detroit. At that time, as I still am today, I was a voracious reader. Along with time with sports, and friends, I read lots of books, and one of them, whose title I unfortunately cannot remember, was how the first seed of mystery was planted in me. The book was an adventure/mystery of a young boy, my age, who became separated from his family while on a vacation to the Grand Canyon. 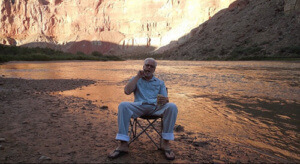 He became lost in the canyon, drawn deep into its mysterious depths, and had spectacular experiences with the canyon, river, and wildlife until eventually found and rescued. With the reading of that book, the Grand Canyon had a hold on me. While I continued my boyhood, pursuing my sporting activities, and other childhood dreams, life threw my family a curve ball. I believe it is John Lennon who said, “Life is what happens to you while you are busy making other plans.” My dad lost his job, and for reasons unknown to me decided to move us to Southern California. One of the really good things about my family was that we were a camping family, so it wasn’t long before we went on a camping trip to the Grand Canyon. As I was still a young boy, my parents didn’t allow me too much distance from them to explore, especially in a place such as this. Their concern was fortified by a now humorous event that occurred when we pulled up to one of the “Look-out” spots for a view of the canyon. My dog, a small beagle, somehow wriggled out through the door of the car before we could stop him, and he ran right at, and to our horror, jumped right over the retaining wall! We approached the wall, expecting to see nothing but the sheer drop our pet took to his death, but on a ledge, just the other side of the retaining wall, was a shaking, quaking, mass of fur … our dog, alive, and otherwise well. It appears he simply needed to relieve himself after a long ride in the car, but needless to say, he never tried that approach again! That boyhood visit only intensified my interest in the Grand Canyon, and as my family kept to the South Rim, the call of the Canyon’s mysteries intensified as well. However, time, being what it is, passed, and along with it, some of my interests shifted. The story from my boyhood resurfaced in my mind, and I wanted to pursue my boyhood dream to where I believed it was calling me; to the bottom of the Grand Canyon. But, how was this to be? I was a family man with responsibilities; lots of them. Life became life again, got busy, and time passed. The trip was a year away, but my excitement was palpable! I began to prepare mentally. Physically, I continued to maintain my health as best I could. And I began the process of researching what to bring on such a trip. With all of my hiking and camping experience, I had never done such a thing as this before! Time again did its thing, and the day of departure was looming. I say it this way because as the day approached, my feelings about it bounced all over the place! Yes, I was excited! I was about to fulfill a lifelong dream! But I was also nervous! At times, that would be putting it lightly. I had never white water river rafted before, the idea of encountering level 4, level 5, or greater rapids was intimidating to me! Well, fast forward to September 2014, at the historical, and until now, for me, the mystical Lee’s Ferry. We’ve bussed in from Flagstaff, met our guides and fellow, not yet, “River Rats,” got “oriented” to our “new normal” lives for the next 13 days, and set off down the Colorado River! This is where the story telling gets difficult for me. I’m not the person who remembers all the fine, and frankly spectacular specifics of the type of rock we are traversing past, the various historical happenings that occurred before us in this place, the age, age, age, of the canyons we either floated blissfully, or bucked and raged, wringing wet through. But it was so wonderful that our guides could tell us all of this and more. Every moment of every day, our guides filled our minds with the geological wonders, the ageless history, and the life of the Canyon and the River. All the while, they kept us entertained, (as though they really needed to), fed, and safe, as we wound our way deeper and deeper into to Canyon’s mysteries. Oh, did I say fed??? Our guides brought new meaning to the word sated! Put simply, they not only fed us, they fed us gourmet! Pork chops, salmon, lasagna, full on salads; they even baked us a cake! Can you believe it? A cake! 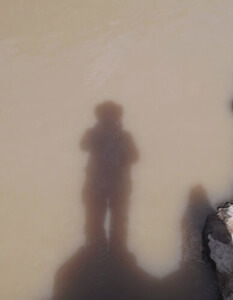 At the bottom of the Grand Canyon!!! I expected to lose weight on this trip. I didn’t! Not complaining! Oh, did I say safe??? Our guides were to a “T”, professional! At the same time, they were playful. These are people who “are in their element.” They knew every twist, turn, rock, and eddy. And speaking as a clinical psychologist, they were good students of human nature. They knew just how far they could let us stray, or stretch ourselves, and they knew just when they should reel us in. They were just what I needed, full of confidence, patient with neophytes, and fully exuberant with life! On one hand, 13 days and 225 miles of river rafting and hiking is a long time. On the other hand, it’s nowhere near enough. There is so much to take in, so much adventure, excitement, and mystery to explore and unfold, so much contentment. Watching and feeling the movement of all the nuances of the river, riding everything from riffles to nearly terrifying rapids, hiking and exploring the back canyons, and tributaries, bathing in the cold river, or better, the unbelievably warm waterfalls. Eating great food, under the stars, listening to the stories told to us by the guides, communing with strangers with shared interests in where we were at and what we were doing, some of which I stay in contact with. All of these things not only met the expectations of my childhood dreams, they far exceeded them. And yet, with all of that, and so much more I haven’t written here, the Grand Canyon retains its mystery! Oh, it opened its arms and let me in; big time! It revealed secrets to all of my sensibilities. But the Grand Canyon is like a very wise spiritual master who knows that no one can really learn in the full telling of things. I go to a spiritually enlightened person in hopes that they will tell me the mystery, but they don’t. They give me rudimentary information, and they sometimes help me find my bearings. But a true spiritual teacher knows that one can only learn by time invested in and listening to the seeming silence of the mystery. The Grand Canyon is such a spiritual master. To say I had the time of my life on this Grand Canyon Whitewater adventure would be a tremendous understatement. Not only was it a trip of a lifetime, it opened me up in ways that “normal” day to day living couldn’t. I see things differently. I feel things differently. I hear things differently. All of these things are now juxtaposed against a backdrop of ageless time. Mystery is allowed to remain mystery until mystery itself is ready to reveal itself. When I listen to music, read a book, or visit a natural place, I experience something beyond the surface. It’s like medicine. It’s healing. It holds me steady in a world that is seemingly becoming increasingly dangerous and chaotic.